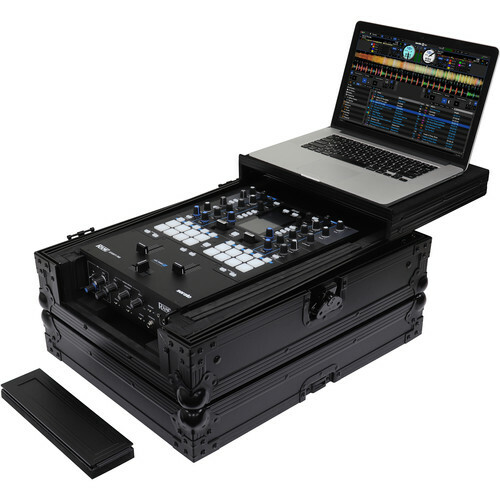 The black label FZGS12MX1XDBL Universal 12" Format DJ Mixer Case from Odyssey is a foam-lined XD Series (extra-deep) mixer case featuring a gliding gear platform over the mixer that you can slide forward and backward as needed for a laptop, beat pad, tablet, or other mixing performance gear. It can be used to store your gear or transport it to gigs. This 12" format DJ mixer case is equipped with a removable front panel that provides full protection during transit but slides out for access to the front mixer controls during use. Other features include: heavy-duty ball corners, recessed handle and latches, 3/8" ply construction, removable bottom, rear cable hole covers, and rear cable panel and ports. It is built with all black anodized and powder coated hardware. Mixer compartment is 13.25 x 20.75"